Strathmore 200 Series Newsprint 9''x12'' Off-White Fine Grain 49 GSM Paper, Short-Side Tape Bound Pad of 100 Sheets@345 Rs [Mrp:-345] - Onlinedeals.discount - A leading product discovery website. Find the true prices of products, read reviews and buy top brand products at reasonable prices. Suitable for – dry media like charcoal, graphite, pencils, chalk, pastels, crayons etc. 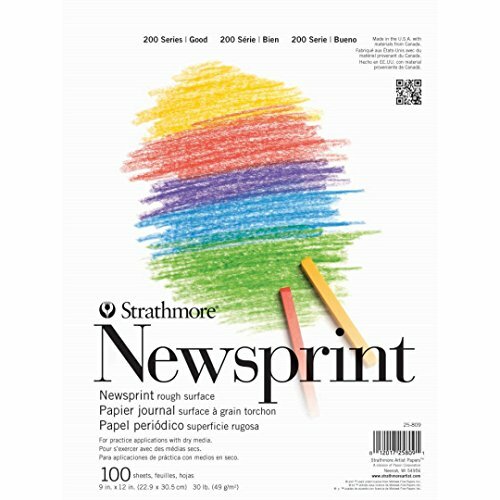 Strathmore 200 Series Newsprint paper is an economical rough surface newsprint for warm up exercises, practice and preliminary sketching. The paper is ideal for dry media like charcoal, graphite, pencils, chalk, pastels, crayons etc.